The head of Monaco was introduced to enterprises such as KNL Networks and TactoTek before his opening speech at the UArctic Congress 2018 arranged in Oulu and Helsinki on 3–7 September. The sovereign of Monaco, Prince Albert II, arrived in Oulu for a short visit on Monday 3 September. The main reason for the visit was the Prince’s participation in the opening of the UArctic Congress, a meeting of the University of the Arctic on Tuesday 4 September. His Highness was also provided with the opportunity to meet a few local technology companies and hear about the research on printed intelligence done at the Oulu unit of VTT, the Technical Research Centre of Finland. The only company that Prince Albert II had time to visit on location was KNL Networks. The esteemed guest was greeted by CEO Maria Alahuhta and CTIO Teemu Vanninen who also presented their company to the Prince. 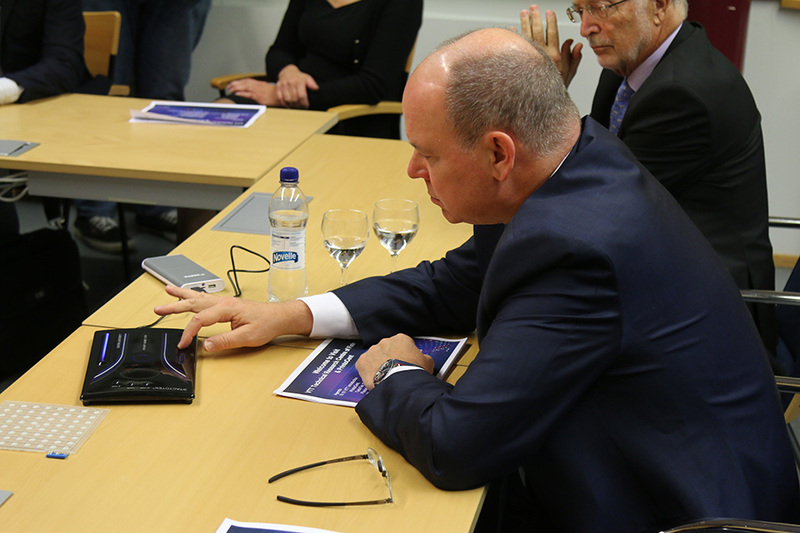 Prince Albert II was interested in KNL Networks’ technological solution where HF radio technology has been harnessed as a means of communication of the modern age – particularly in the maritime industry – after being overshadowed by satellites for 50 years. The honoured guest is involved with issues concerning the Arctic, and he was pleased to hear that the global network of KNL radios covers all the sea areas in the world, thus including also the blind spots left by satellites for example in the vicinity of polar areas. The benefits of KNL’s solution are technological simplicity, reliability, security and inexpensiveness – all qualities that impressed His Highness. He was also surprised to hear that for example the National Geographic fleet – flagship Explorer included – utilise KNL technology when sailing the Arctic waters of the world. At the end of the presentation, the dignified guest saw a demonstration where e-mail messages were sent between the Oulu Technopolis and a research station in Svalbard using the KNL radio. From KNL Networks, the Prince moved on to VTT where he was presented with the research on printed intelligence done in Oulu, along with a few other companies. One of them was TactoTek which has its background in VTT and specialises on injection-molded structural electronics. During the short demonstration, the Prince got to handle several injection-molded products presented by TactoTek CTO and co-founder Antti Keränen. Other enterprises presented at VTT included Movesole, creator of a smart insole; Flexbright, developer of LED foil lighting technology; and Goodwiller, innovator of a handy, single-use blood alcohol tester. “The companies I saw really exemplify the dynamic nature of innovation in this part of Finland. It is simply amazing to see that you are generating so much great economic activities but also great innovation capabilities. It is a great inspiration not just for me but for others in the world. There is desire to use technology in the right way and have a look into the future and in different business areas and clean energies. It is great for our collective future,” His Highness stated. Besides the company presentations, the Prince was introduced to research at VTT by Ilkka Kaisto, Director of innovation centre PrintoCent, and given a tour of the printed intelligence pilot factory located within VTT premises. From VTT, Prince Albert II continued his trip to a press conference held at historical Maikkula Mansion and onward to the main event of the visit, the opening of the UArctic Congress that took place at the University of Oulu. As a keynote speaker, the guest of honour delved deep into the challenges touching the countries and peoples of the Arctic region and thereby the whole world. “The mitigation of climate change is everyone’s concern. Whatever we can do everywhere in the world to lessen our personal footprint, e.g. by promoting and encouraging the use of clean, alternative energies – it is a constant battle. We have to move away in a short time to a carbon-free environment. Everywhere in the world. If we are able to do that, hopefully in the not too distant future, we are better off everywhere in the world, including the environment. It is a long battle and not everyone is on board, as you know,” the Prince noted.